MIAMI (AP) Mariano Rivera's first victory for the New York Yankees came on May 28, 1995. A day later, Derek Jeter made his debut with the club. They've been linked ever since. "First, it's hard to believe that no one has gone in unanimously prior to him," Jeter said. "But no one deserves it more than him. You're talking about someone that did his job as well as anyone that played the game. He's a quality individual. He's a Hall of Fame person outside of just being a Hall of Fame player." "I had the privilege and pleasure to play with him since I was 18 years old," Jeter said. "We grew up together. We're like brothers. I couldn't be more excited for him." 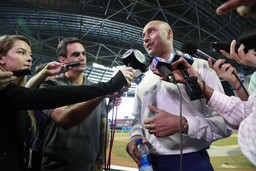 Jeter, who is overseeing the latest rebuilding effort by the Marlins and spoke Monday while several construction crews were working behind him on various parts of Marlins Park, said he hasn't given much thought to the likelihood of his own enshrinement in Cooperstown in 2020. "I've got a lot of other things to think about," Jeter said.